Top tips for suggesting sound in your digital art. While it’s not possible to show sound in a conventional, still image (multimedia interactivity aside), it is possible to imply it in the reactions by characters and objects in a scene. Impacts throw up particles and cause vibration, for example. With that in mind I’ll show you how to draw a tolling church bell, viewed from a high eye level (that enables me to show details you wouldn’t be able to see from ground level). I can show small things that might be shaking, vibrating or even dislodged, and I can add some humour with the gargoyles covering their ears. You could also have alarmed pigeons taking flight, roof tiles sliding about and other fixtures swaying. 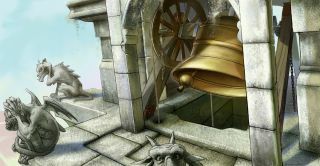 For this painting I used SketchBook Pro to sketch out a belfry and bell, because it has a decent perspective rig, Ruler and Ellipse tools. Using a two-point perspective rig with the horizon line fairly high, I mark out some simple shapes, such as a box around the bell. I use the Ellipse tool to draw the bell. I look at various photos to understand what the support setup might be for a heavy bell, then sketch something appropriate. I use some texture brushes to help make areas look more like stone. Using these same brushes on the gargoyles, it should keep the viewer guessing whether these are alive or not. We can introduce sound to this scene through the reaction of the critters around its source. That, along with various other clues dotted around. I pose them all with claws to their ears, and make sure the bell is poised with the clanger just after the strike. I build up the stone textures and ensure everything feel solid, particularly the clanger because it’s a focal point. I avoid vibration lines and other such comic book devices. Instead I’ll have a few bits of masonry coming loose. Try to have your effects fit in with the visual style you’re using. This article originally appeared in issue 146. Buy it here.